I am pricing a commercial job. I am generally a resi guy with some small commercial, I did an ACE hardware upfit. I am pricing a job with 2 new 1000amp 120/208 services. It is for a strip mall remodel. They are gutting 8 units and redoing everyting including the service. The specs call for a 1000amp fused switch to feed 5 meterbases. They are using 3 sets of 500kcmil. What is the best way to spice those in a gutter and feed the meters. I priced out the polaris lugs with 8 500kcmil ports. It just seems that split bolts would be a mess. This is a learning experience for me so any help would be nice. There are some Polaris knockoffs that are a little cheaper. I got some from City Electric. I assume everyone has them. Are we talking individual meter pans, or a 5 meter 'stack'? IF you can use a stack, it's a lot cleaner, and really saves labor & materials splicing all the feeds. That's a classic Ryco job. 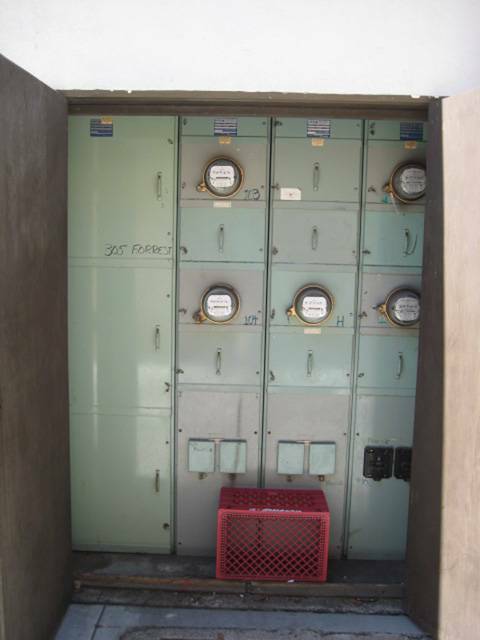 They use bolt-switches, fused, to feed a meter stack with T type fuses for each tenant in a NEMA3R box. I can't imagine you engineering anything cheaper to rig up. You may have to purchase a wireway extension box if your service feeders to tenant panels have to go overhead. Out my way a rehab that complete means that the latest Code must be followed -- no grandfathering. Biggest bid issue is just how open the project will be -- and what is your bid scope. If going overhead seriously consider aluminum MC feeders. Ultimately, re-habs involve extras. THAT'S where you recover from your under-bid. The plans spec a gutter feeding 5 individual meter bases, then up to 200 amp disconnects. It is an expensive set-up, but it is what is spec'ed. If I was more comfortable with this type of work, I would initiate changes. Also you know how it works. "Can I get a quote in two days". I will pipe along the back of the bldg to the individual tennants. It measures out to 2900ft of 3/0 cu. That is a lot of wire. I did price the knock off polaris from City, not a bad price. I get most of my stuff from there. I could use aluminun, but copper is spec'ed. Hopefully everyone will bid according to the drawings. I do business by quoting what is asked for and delivering. It's frustrating to lose a job to someone who does less. That's all I'll say. We'll see what happens. I work commercial and have built many such installs. Your scheme would never happen out here. Ryco NEMA3R boxes with an integral vertical side gutter is all you'd see in competitive bidding. Who ever wrote the specs is NOT an EE experienced in this bread & butter install. I'd offer two bids: a winning bid and an as-spec'd bid. BTW, I rather suspect that you're being gamed. Another bidder is standing ready with the winning bid per my scheme. He'll just point out the $$$$$ savings and speed of construction. I would also include pictures of what a Ryco install would look like and what his proposal is going to look like. Just drive around town and you'll see 3R SERVICE boxes, Or contact Ryco. I've NEVER seen a landlord willing to waste money on copper feeders. Our commercial practice is to stub into each demised space and let the tenant build it out. An allowance is provided at the time of the lease -- by the landlord -- so his investment/ exposure is known. 2" EMT stubs and three phase power caps you at 200 A. 2.5" EMT permits 200 A aluminum conductors. Normally this is NOT done. IF the conduit is below grade 2.5" PVC is preferred. Taking pipe fill to the limit on long underground runs has its risks. If the landlord wants to reduce his TI allowance then he ought to supply MC fed panels. MC in open construction is drastically easier to install than EMT. For technical details just dial up the cable companies. If the landlord wants great flexibility he can just terminate the MC as a coil able to reach reasonable locations. The most popular interior panel locations are in the back wall or in a bathroom wall -- facing outside the bathroom. With underground conduit the exterior wall is favored. With overhead MC/EMT the bathroom wall is favored. In some TI's the bathrooms are already framed unisex and handicapped dimensioned -- perfect for the MC approach. IF you naively submit a price per specs you'll discover that the other guy corrected the specs and walked away with the bid. And you completely wasted your time. Such deals should be termed fake-auctions since they were shams from the get go. The GC already had his buddy in place and your roll is to submit an absurdly high loser bid so that his buddy is under no competition. Enlighten me please; what is a RYCO?? I did the google thing & nothing electrical. You're on the west coast, I'm east & the OP is east also, like south east. Here we use a meter stack, with or without (>6 switch) main OCP; NEMA3R, w/tenant mains. OH or UG POCO entry. Quick & clean. Here is a pic of a RYCO switchboard.